Coverage of our Veterans for Peace (VFP) delegation trip to Okinawa was in the two most popular newspapers virtually every day while we were here. 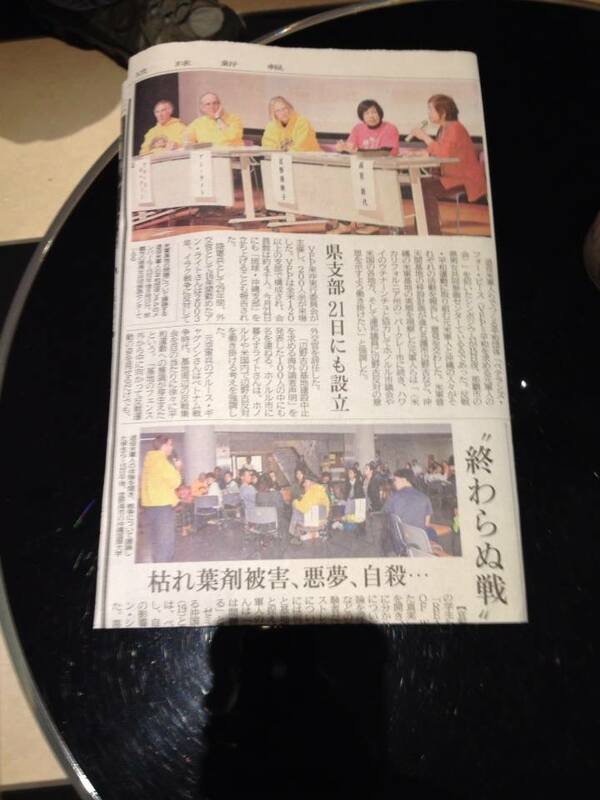 Yesterday they carried two stories - one about a great meeting we had with students at Okinawa International University and the other reporting on the tour concluding event in the evening that drew about 300 folks. We heard that some conservative politician in Tokyo had made the statement recently that their right-wing government (which the US loves) needs to shut these two papers down! Obviously their strong support for the anti-base movement on Okinawa is too much for Tokyo (and Washington) to stomach. Imagine how things would be different for us all around the world if our media was not under the control of corporate interests? When the public has access to clear and truthful information they are better able to make informed decisions that help move politics along in a positive direction. Noam Chomsky often says: "How can you expect the American people to react to an issue when they don't know anything about it?" In the US our media is pathetic - the news is squeezed out and we are handed trivia and entertainment thus the people get dumbed down and politically neutralized. The Okinawan people are fortunate at this time to have some media that is doing what TV, radio and newspapers should do..... give the people the truth and let them decide. That is the only way a real democracy can function. Without an informed citizenry democracy is just a facade - an illusion like Disney World. I was talking yesterday morning with VFP delegation co-organizers Tarak Kauff and Ellen Davidson before they flew back to the US. Tarak remarked that he felt VFP had really had an impact in Okinawa and I think he was right about that. One key reason for that impact was the coverage that the delegation's solidarity visit got from the local media. There is a group of right-wingers in Okinawa called the Osprey Fan Club that sometimes shows up at anti-base events to protest in favor of the US military occupation. The other night when a group of us jumped into a cab, to get to the tour finale event, the cab driver took us to the wrong address and by the time we finally got to the right place people were getting nervous that something had happened to us. When I got up to speak I told the story about the taxi driver dropping us off in another part of the city and said that we wondered if the cabby might have been a member of the Osprey Fan Club and had repeatedly seen photos of us in the newspapers with our bright gold sweatshirts on. The gag got a good laugh from the audience.